In 30 more 2015 running in the half marathon in Sibiu to support the babies of The Architecture association. I signed up 4 colleagues to run for them: Raul Tarnaru (General Manager), Marian Moronescu (Engineer), Groza Vasile (Chief Mechanization) and David Sebastian ( Commercial Agent). In addition we are proposing and its official sponsor us through this action to support as much as we can the initiative of the architects volunteers, being a field close to the one in which the company activates our. “De-a arhitectura in my city” is an optional course of education for architecture and the built environment for classes III and IV in public and private schools from all over the country, with the enthusiastic support of volunteer architects. Because we want this course to remain free and accessible to all children, we propose that by participating in the Marathon Sibiu 2015 to help them find resources to provide free student notebook and diy materials required course. For the school year 2015-2016 the optional course will be taught in 12 classes in Sibiu (10 classes in Sibiu, a class of River Sadu, a class of Agnita) + 4 classes in the school year 2014-2015 who have opted for teaching the course in the 2 years. So about 480 de children will be direct beneficiaries. The indirect beneficiaries of the project are families with children, teachers involved in the program, the 11 the architects of the volunteers who assist teachers at each hour de course and not in the last row Sibiu on which children, future citizens will put their mark. The built environment is the framework in which we operate life, is the environment made de the human hand. He depends on de the natural framework in which is inserted, can be urban or rural, and bears traces of the past, being lived in the present and prepared for the future. In it people put their mark, turning it into the function de their technical capabilities so as to meet their needs and values. The study of the built environment for children is a key de understanding and de involvement in their environment de life, a way de to find out what gives quality and how can they improve it now and later, being a middle de stimulate civic responsibility. There is a way de to enrich visual culture, de to learn a new vocabulary,de to practice and de them be encouraged creativity, curiosity, personal initiative, a critical sense, skills de communication and community spirit. Knowledge de by the city children's issues and lay the groundwork for a social responsibility and an urban culture, lead to a positive attitude de city, increases curiosity and attention to de the transformations of the urban environment. Iulia Nistor, architect volunteer: "IMPORTANT! 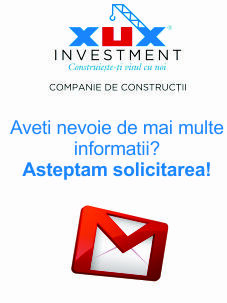 XUX Investment (www.xuxinvestment.ro) support the education of architecture and the built environment in the schools of Sibiu! We are enormously pleased when a private company gets involved in education. Together we have more chances to shape our beautiful world!"